NEW DEVICE IN OUR OFFER in 2018 !!! Dual channel ultrasonic interface LunaDAC-1 is designed to reproduce a very wide spectrum of signals with frequencies from very low sounds or even infrasounds up to ~190kHz. It is also possible to work from 0 Hz (DC) in the special version on demand. The device was created mainly to reproduce echolocation of bats or other ultrasounds (as well as audible or infrasounds) from a computer. It is the link connecting the computer with our active Luna Speaker UMS-1 ultrasonic speakers or LunaLure UMP-1, or the latest LunaLure UMP-2 devices. 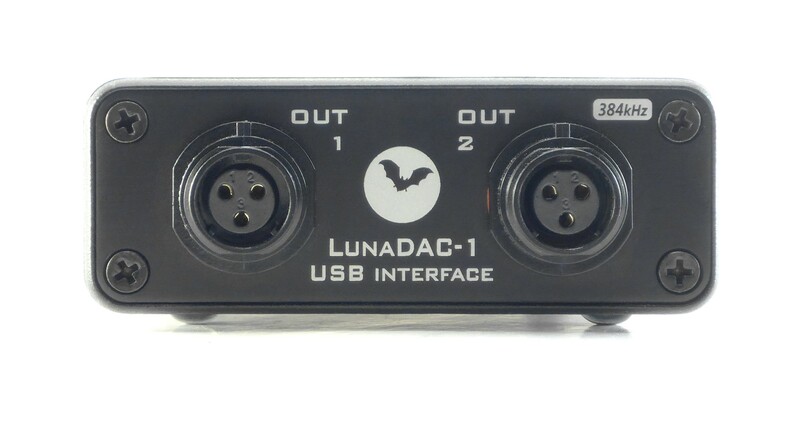 Thanks to the use of high resolution digital-to-analog converters with bit depth up to 32 bits and output anti-aliasing filters optimized for ultrasound reproduction, it is possible to proper convert digital recordings to analog signals available on two output connectors of the device, to which you can connect one or two external ultrasonic amplifiers or active loudspeakers (eg Luna Speaker UMS-1 or LunaLure UMP-1 or UMP-2) or other similar devices. Analog signals are sent to the receiving device(s) via appropriate signal cables. They are supplied as an optional accessories or as a standard cables available with the above mentioned devices. Cables are equipped with screwed industrial waterproof connectors with gold-plated contacts. These connectors provide a secure connection in all conditions. 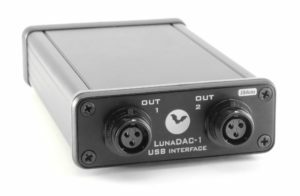 Connection to the computer is via classic USB “printer” cable (included with the interface) uses the latest USB Audio Class 2.0 standard. This specification allows to increase the maximum sampling rate of reproduced recordings up to 384 kHz (not only up to 192 kHz, as was the case in audio devices) and allows using ASIO drivers at such high resolution, which ensure lossless transfer of full bandwidth with flat frequency response to approx. 190 kHz. Thanks to this, there is the possibility of direct control over the played signals both from compatible audio editors and programs supporting such high sampling rates, as well as from playlists of multimedia players, eg the popular and free Foobar player (equipped with the ASIO-out plug-in). This is useful in situations where manual, interactive selection of signals for reproduction or visual control of reproduced recordings is necessary (eg during scientific researches, bat detector trainings, etc.). The device also has built-in output signal line buffers enabling the connection of significant electrical capacities and thus enable broadband transfer even through long signal cables, without noticeable signal losses. The device is powered from the computer’s USB port through the same connection cable through which the digital signal is transmitted and has also been optimized in terms of power consumption. So it is possible to work for several hours with a laptop or even a tablet in field conditions, without access to power from the power grid. The use of high-quality modern components in surface mounting (with the exception of connectors, which was intended) ensures many years of trouble-free operation and long-term compatibility with the latest operating systems, and miniaturization and optimization of the mosaic of connection paths on digital and analog plates allowed to obtain very small external dimensions, which in combination with the simplicity of service is a breakthrough in both price and comfort of use, especially when compared to classic DAQ devices (specialized data acquisition cards with additional built-in DACs). 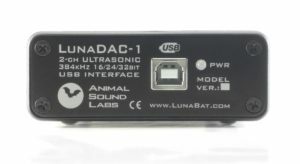 Our new device uses high resolution DAC converters with Delta-Sigma modulators from famous Burr Brown company (owned by Texas Instruments), with 8-times oversampling and over 110dB dynamics used so far only in top class audio devices, but with different settings of the digital filter responsible for the impulse response speed, as in the case of bat echolocation or other ultrasound reproduction is of great importance – all this frees the signal from typical distortions (noise, aliasing and intermodulations) generated in classical transducers used in DAQ cards (eg Data Translation, National Instruments, Measurement Computing devices etc) or in other devices for ultrasound reproduction (eg Apodemus BatLure). As a result, the reproduced analogue signal is practically indistinguishable from the original recorded signal, especially in the case of recordings with signals lying between 1/4 and half of the sampling frequency, where the aliasing generated in classic DAC converters is significant and introduces very strong distortions. So in order to get a signal free from aliasing interference, always the best solution is to use a much higher sampling rate than the frequency of the reproduced signal, if only the DAC converters of the reproduction device allows this. 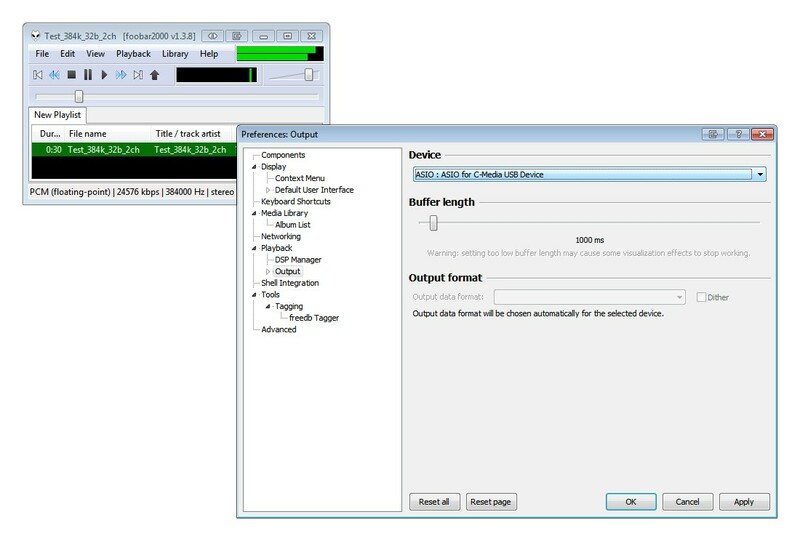 Computer playback can be performed using programs that correctly support the latest USB Audio Class 2.0 audio standard and ASIO or WASAPI compatible drivers and sampling rates up to 384 kHz with 16-, 24- or 32-bit resolution. Audacity editor, although it can support ASIO drivers, it can not be distributed with ASIO support as an open-source program due to license reasons (with current version 2.2.2), but after recompilation from the source codes (LINK) probably can be also used – this possibility is not tested yet, however editing of 384 kHz files is still possible even with a standard Audacity version). Newer versions probably also will work with described frequencies. Other programs will be tested soon.